Twice a week about 15% water change. Amazon swords are having a explosive growth. They are going to be trimmed so that they remain at the back of the tank. I have already removed a hand length of runner, but more needs to be removed. Unfortunately non substrate plants (there is a windov fern in there) had almost zero growth because of lack of neutrients in water. 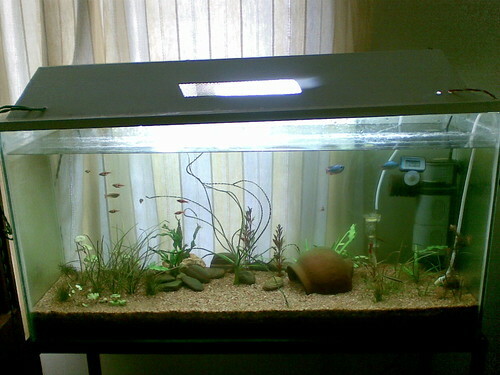 In one way it is good, as there is no algae in the tank. @ flickr http://www.flickr.com/photos/24596644@N03/sets/72157606495830530/ for full sized pics. Rohit its really clean good looking planted tank just wait for one more month and use daily dose of microsol B YOU WILL GET AMAZING RESULTS. I like your tank so much. Thats one differnt tank from all the routine scapes. Nice combination of thin leaved plants. Would have added some long leaf plant on left-rear end. May be: narrow leaf java fern/apongeton[not vals as u already have some hi-maintanance runners]and may be some more hydrocotyle on left-foreground and then....WAIT. Would want to know what lights you are using tubes?/PLL?/CFL? Nice tank . why not you add glosso for forground?It will add more beauty. Nice tank, very peaceful setup. Hey guys, thanks for the encouraging remarks ! @sai : I think the idea of adding Apongeton on the left rear most side is a good one, as there is definitely a scope of addition over there. One big leafy plant will do wonders there ! The tubes are nothing but CFL (cool daylight) . One thing to note is that I get diffused natural light from the window. 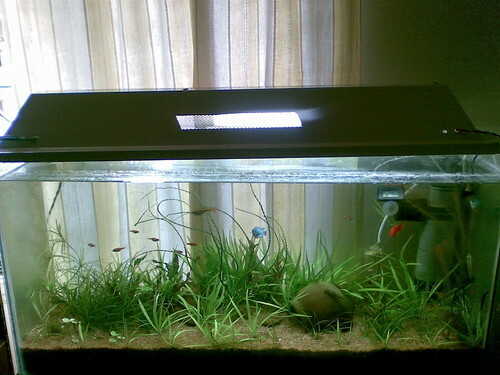 @kaushik: glosso will add a softer look to a more spiky tank, i will try to get my dwarf hair grass grow well. The front area will be removed off the amazon swords. Another problem is that glosso will need high light, and have seen amazon swords not growing well in a high light zone. Growing plants which are not substrate rooted is really a tough one in this tank, as because of no dosing, and substrate plants having high growth, floating plants are not getting a chance. In fact there is windlov fern and chinese ivy in the tank, but they have not even an inch ! But lets see after some trimming of swords, if they get the chance. A simply superb and neat tank setup I like it. 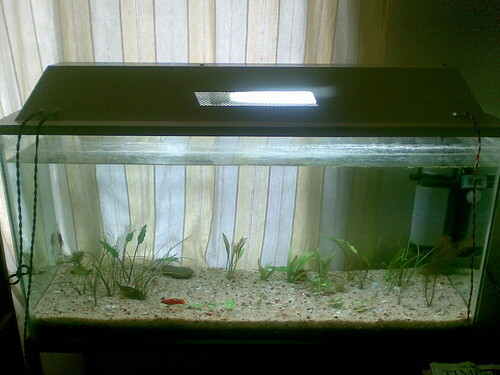 Very good neat scape Rohit..
what fishes your having in that tank? Dwarf hair grass is yet to grow in the open area. That is one slow growing plant I have see. 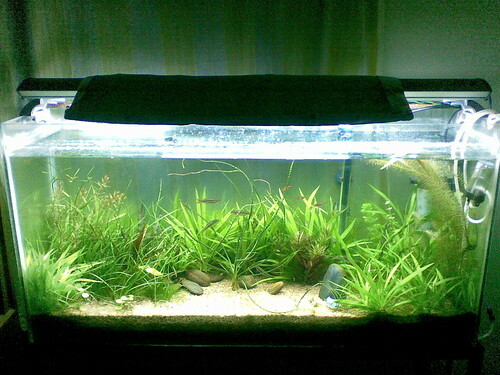 Your tank is giving very soothing and serene effect, loved it! IMO try a foregrund plant with different leaf structure instead of straight lines will look best. Start dosing Macro & Micro Nutrients and see the growth result. @Hamza : Which one do you suggest ? I cant say about Glosso as I've never tried it, seems to be a difficult plant. Riccia is very easy to grow, you can have a lovely carpet in a little time, but how are you planning to keep it down? Marsilea hirsuta is also a beautiful looking carpet plant, requires moderate level of maintenance. you can also try that.